Can two graphics cards be as good as two GPUs? There's a split between the two multi-GPU camps. Both offer options for the manifold use of graphics cards to bump up framerates in your favourite 3D spectacular and yet substantially more rigs run NVIDIA's SLI than AMD's CrossFire. Indirectly, UltimoPC's SLI rig gives us a little insight as to why this might be the case. But how do the rivals' top-spec graphics cards stack up in multiples? Originally the idea was to have an SLI rig with twin GTX280s (here well demonstrated by the Scudo) up against a CrossFire rig with dual 4870X2s. Sadly, after almost a month of building, testing and rebuilding our friends putting together the AMD rig still couldn't rely on it functioning in any reasonable state. That should give you an idea about how much more reliable AMD's CrossFire drivers are these days. So it's all about SLI then? Well, that's still a bone of contention as some companies, such as Beast Computers, are having reliability issues, shying away from building multi-GPU machines with the offending 790i boards. UltimoPC has opted for the excellent Asus Striker II Extreme board, packing its high-end features, DDR3 support, energy efﬁciency and serious overclocking potential. The overcooked BFG GTX280s purr away happily under the hood of the Scudo with SLI enabled straight out of the box with no perceivable problems. Taken in comparison with the single-GPU Scudo the extra performance of the added card is impressive, giving at the very least another ten frames per second at the highest resolution we can muster. Playing Crysis at 2,560x1,600 at 34fps, and World in Conﬂict at over 40fps, really is nothing to be sniffed at. A win for NVIDIA though is sunk by the sheer performance of the 4870X2, as shown by Yoyotech's Warbird from PCF219. True the Scudo adds 10fps to the Warbird's Crysis score, but in WiC and GRID the twin GPU offering – even with NVIDIA's ﬂagship cards – can only just about keep pace. The AMD box is around £700 cheaper than this SLI rig and is offering more-orless equivalent scores. One of the many positives of the single-GPU Scudo is the boot drive: the speedy WD Velociraptor. To keep the GI-01 SLI below two grand, that's been replaced here with the slower Caviar. This makes no real difference to gaming speeds, but loading was seriously improved with the faster HD. The pre-release version we tested came with a bog-standard 2.66GHz clockspeed on the Intel quad-core CPU, but the ﬁnal units will all come overclocked out of the box at 3GHz. This OC will boost the performance ﬁgures slightly, but still not enough to put daylight between it and the 4870X2 rig. The Scudo does hold its own against the Warbird in future-resistance. With DDR3 memory likely to make 2009 its dominant year then do you really want to put your money into a brand new rig with last-gen memory? But still, with Nehalem so close, do you really want to bet on a last-gen processor/mobo setup either? Once Intel's brand new combo arrives – with the X58 boards now ofﬁcially supporting NVIDIA's multi-GPU platform as well as AMDs – then we should see prices on these sorts of rigs plummet. So if there's two thousand pounds in your pocket begging to be spent on a gaming rig, should you throw the lot at this SKU of the Scudo? With the performance of AMD's 4870X2 it's hard to recommend putting your wallet behind NVIDIA's top SLI pairing. There is Yoyotech's Warbird, although in the last month the resurgence of the US Dollar has meant the price has leapt up £100, and if you're in need of a pre-installed operating system for it, that's only going to bump the price closer to £1,200. 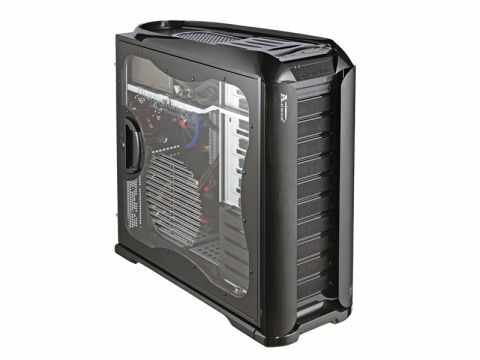 The Scudo SLI is a decent machine, well specced and well made, but simply can't compete on the GPU front. UltimoPC's similarly priced P45-based, twin 4870X2 rig though should ultimately blow this machine out of the gaming water, leaving SLI for the NVIDIA fan-boys alone. So long as the drivers play nicely, that is.